Man, I feel like I should become a civilian in the city of Halifax after all the showers of music the city has been giving me. They’re like the heartwarming showers I take after listening to the music the city of Hamilton sends me. After receiving a compilation from Poncho Records and a rather good EP from Shadow Folk, it’s now time for The Everywheres to show what they’ve got. 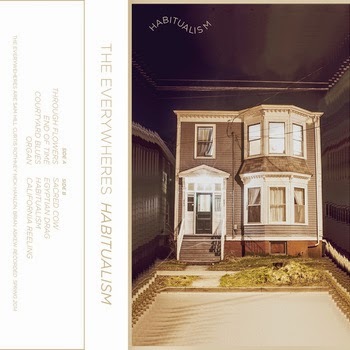 Habitualism is the band’s new album, and it is available on cassette, which is awesome. It seems the city of Halifax is home to psychedelic indie music, which the aforementioned compilation definitely confirmed with nineteen different bands coming together to collaborate beneath the same genre umbrella. The Everywheres perform a similar kind of music, with a continuous haze strewn over the sounds but whereas the other bands seemed to have a lo-fi quality to them Habitualism has a really good level of production to it, and the instrumentals excel at being full of different layers of dreamy guitar riffs and melodies to really help them go down well with everybody that hears them. Through Flowers opens the mixtape with a clean, heavily-echo’d guitar riff that emits all kinds of chill vibes. These vibes only continue to grow as the vocals slip into the airwaves while the drums add just a tiny bit of texture to it to possibly create the greatest tasting sonic sandwich you’ve ever heard. The Everywheres aren’t afraid to let loose either as they deliver punches of guitar into the track to create the slight tension usually formed inbetween eating a sandwich and…disposing of the sandwich. I have IBS so it’s probably a little different for those of you who are completely able-boweled, but anyway it takes one final lead melody to bring this track to a close and set the rest of Habitualism off to the greatest start possible. The Everywheres have a great talent for adding groove to their music as tracks such as End Of Time and Organ feature hooks that will remain inside you for a very long time, while also being generally upbeat tracks too. While the record overall is pretty easy to listen to, it is nice to be able to have one or two tracks that stand out with a little difference, which is exactly what we get with Habitualism. This is a record that is varied to the max, like really varied. As if one day I wake up as a white guy and the next a colour of the rainbow, it’s that varied. Habitualism is a superb album and is definitely going to become a reason why people should buy cassettes again. The Everywheres have delivered something that is entertaining from start to finish with no bum notes, and even though they stretch their genre as far as possible the record still remains cohesive and even easier to listen to. Stream Habitualism below, purchase it digitally for however many currency you want, then purchase it on cassette and then after that, possibly check out Exploding Head Syndrome on Facebook and Twitter.